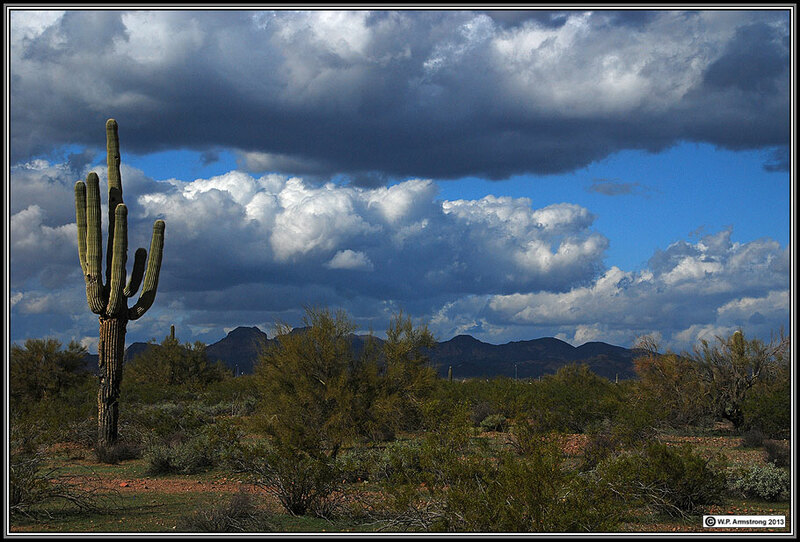 This spectacular volcanic mountain has a complex geologic history of eruptions and erosion. During the past 25 million years it spewed out massive amounts of volcanic ash that became fused into welded tuff under tremendous heat and pressure. Other eruptions produced flows of basalt, andesite, rhyolite and dacite. 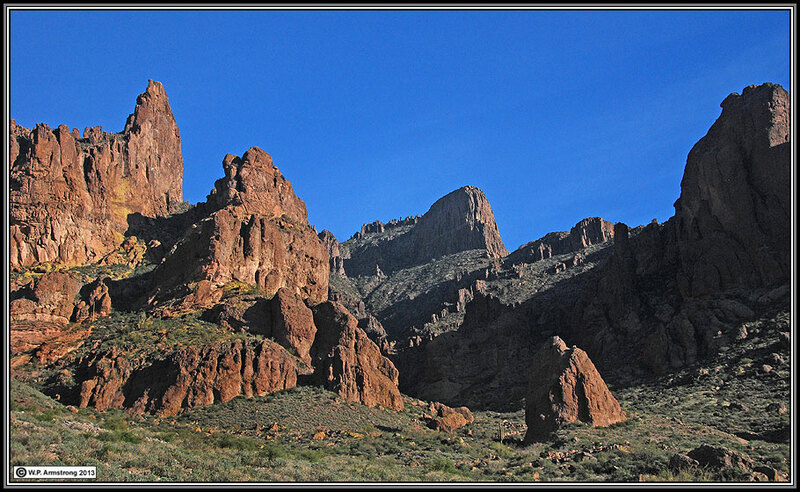 Many of the extrusive rocks from this violent volcanic past can be seen along trails on the western slopes. Gray and reddish andesites contain beautiful crystals of plagioclase feldspar. 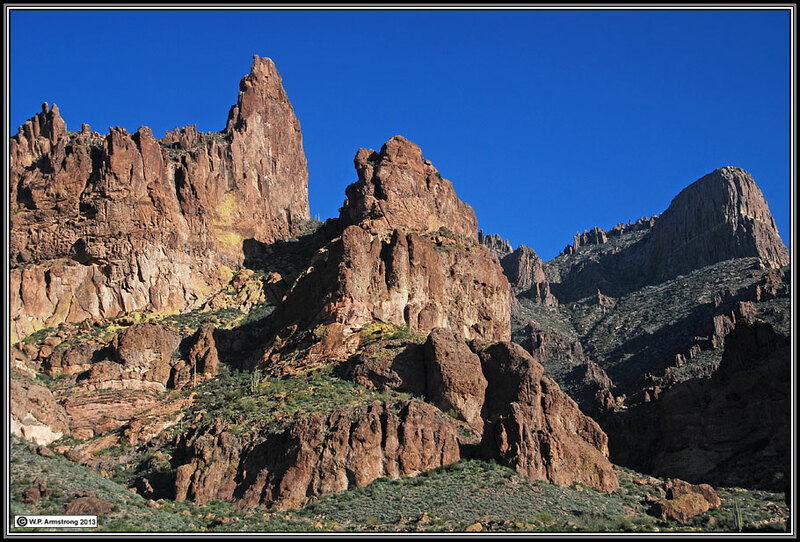 Towering spires and cliffs above the Siphon Draw trail are composed primarily of dacite. 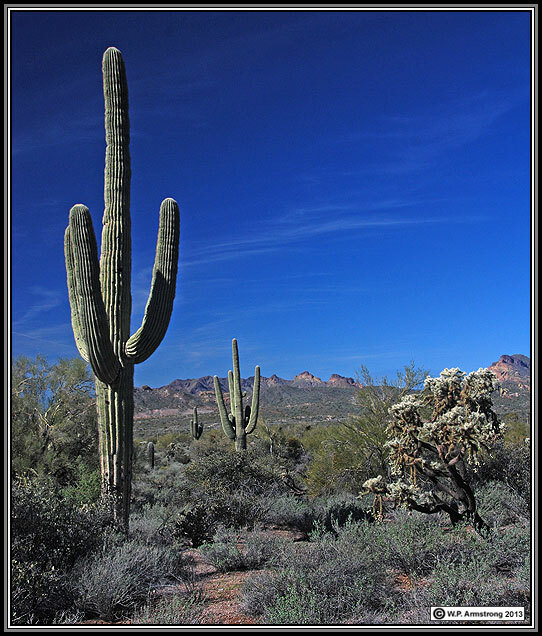 Some boulders are covered with colorful green crustose lichens and desert varnish. 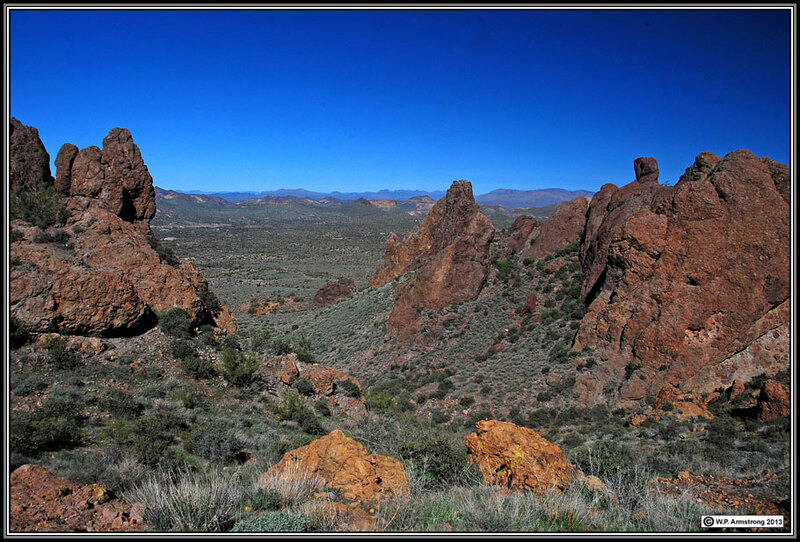 The sound of a nearby mining train at Goldfield echoes among the many pinnacles and vertical canyon walls. 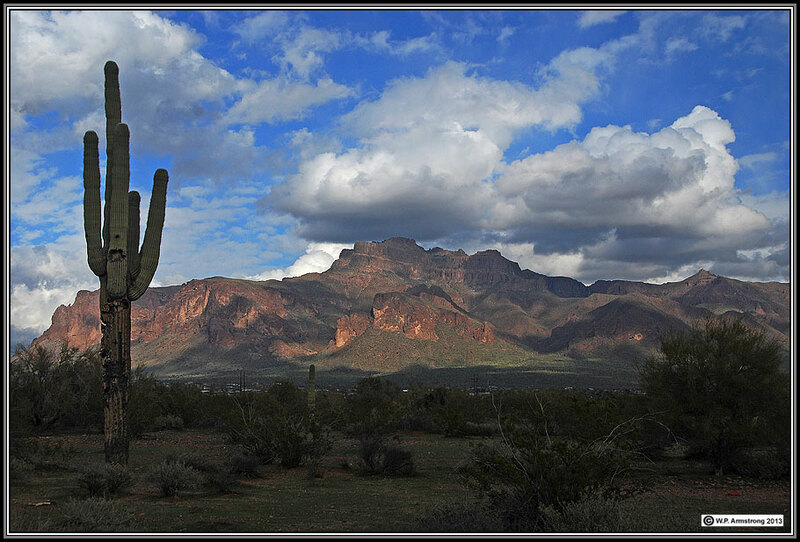 Click On Image To Return To Superstition Mtns Home Page. 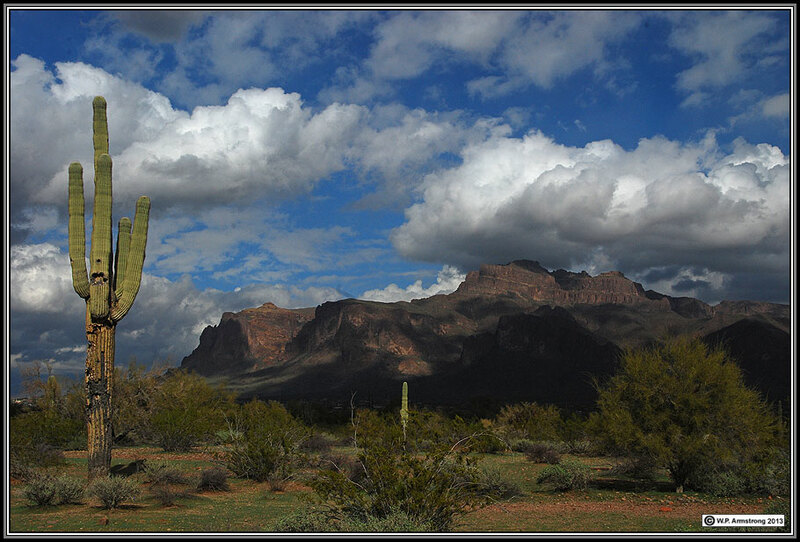 The Superstitions have a complex geologic history dating back more than 25 million years. 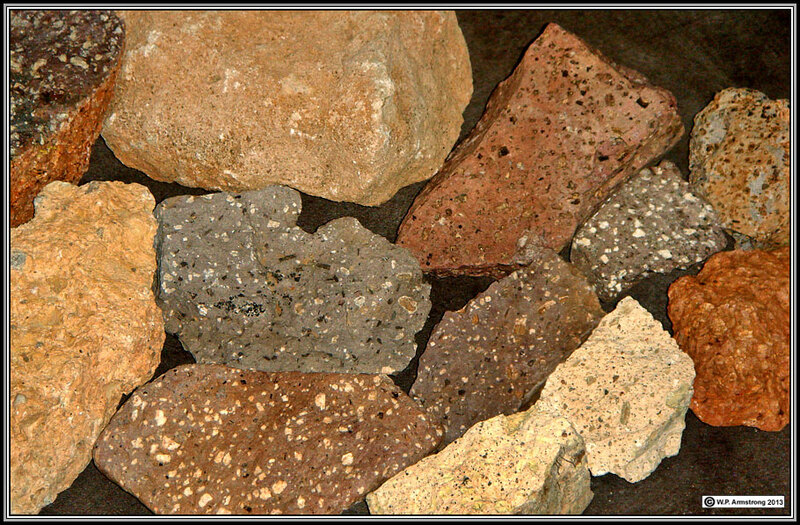 They are composed of a variety of extrusive volcanic rocks including basalt, dacite, andesite, rhyolite and welded tuff. 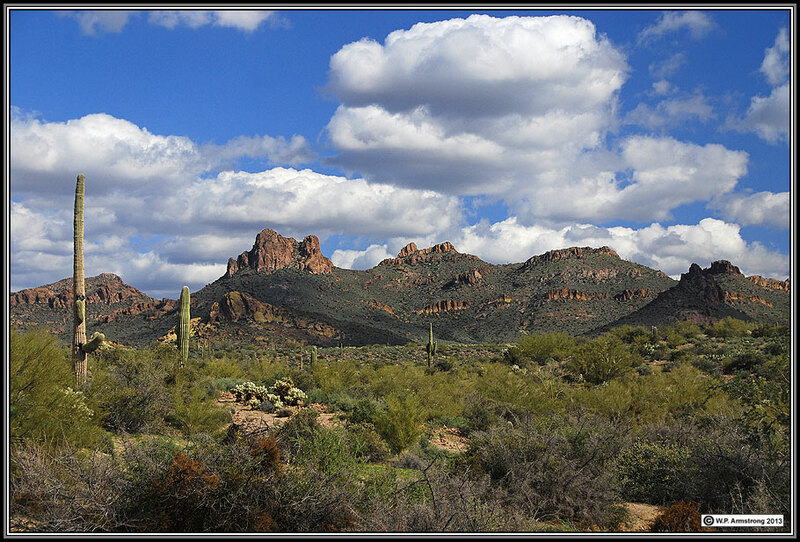 The above sample contains some of the common rocks in the alluvial areas on western side of the Superstitions. Porphyritic andesite with crystals of plagioclase feldspar. 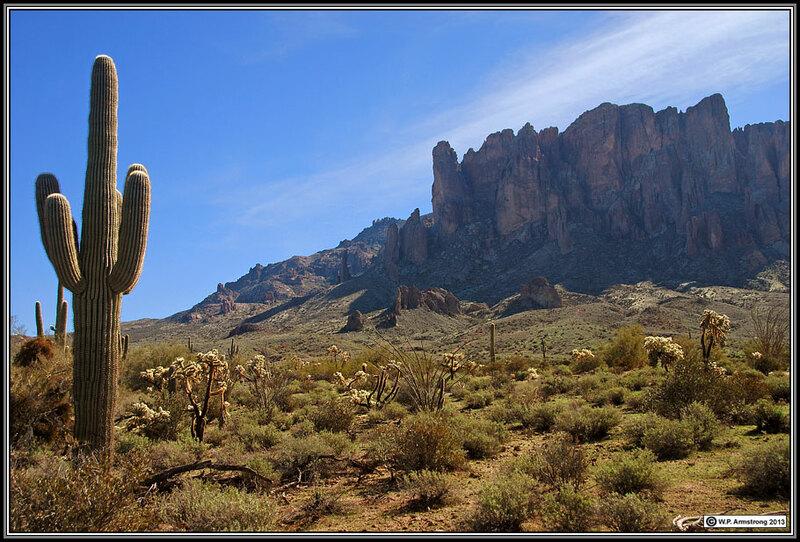 This igneous rock was extruded from ancient volcanoes that formed the Superstition Mountains. 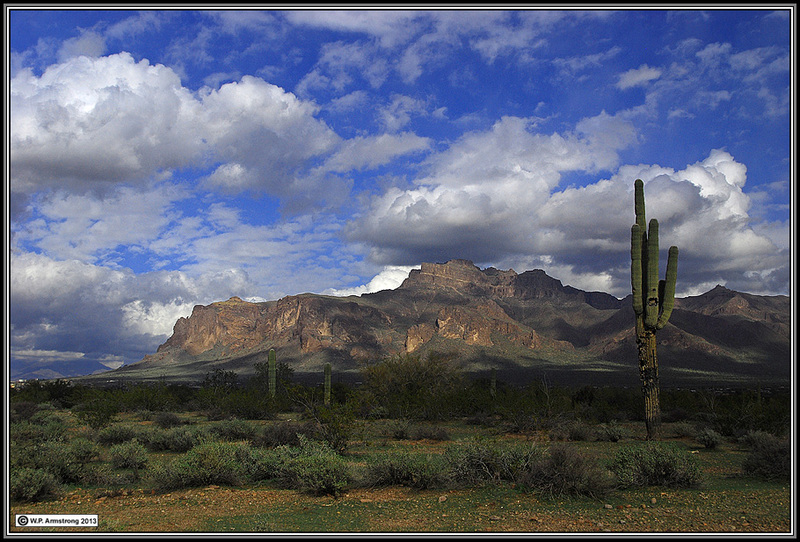 It is common in the alluvial areas on the west side of the Superstitions. 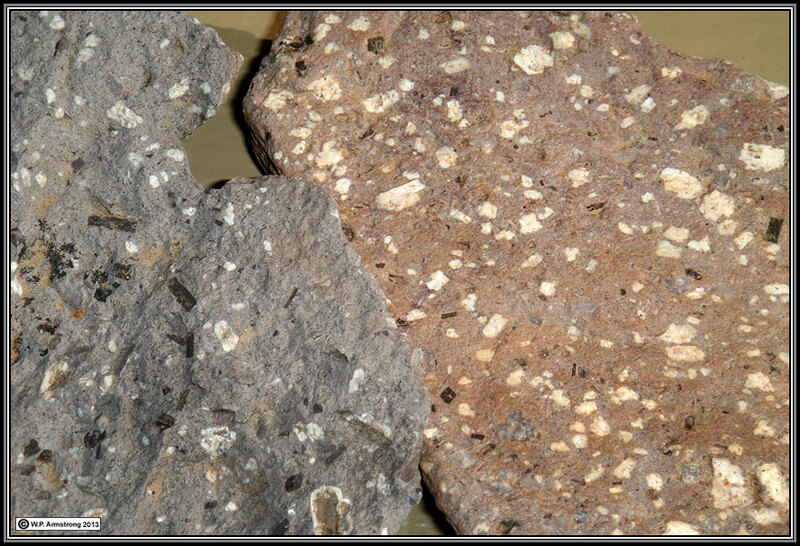 Some references refer to the alluvial rocks as mostly welded tuff, dacite and decomposed granite. Disclaimer: When I originally posted these close-up images in 2013, I neglected to mention rock-inhabiting fungi (RIFs) of the division Ascomycota. They are extremophiles that live on and within exposed rock surfaces in extreme habitats. I originally thought they were cells and spores from a crustose rock lichen. According to lichenologist Kerry Knudsen of UC Riverside, they are rock inhabiting fungi called RIFs. 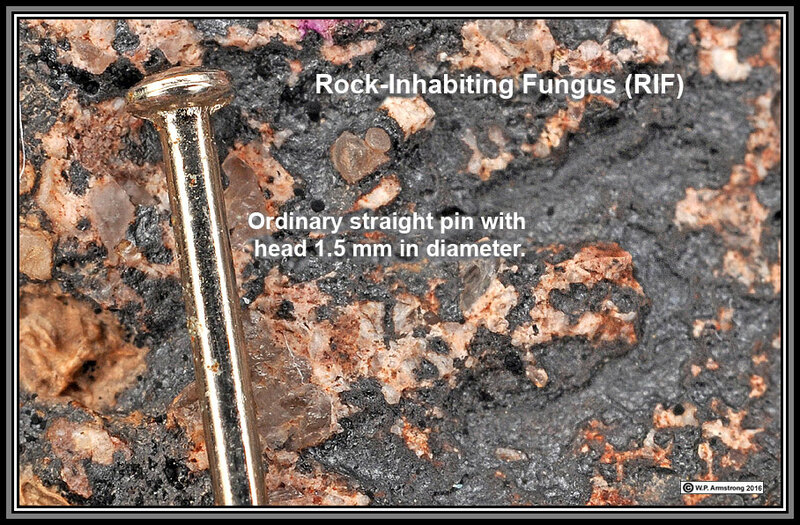 Black, rock-inhabiting fungi (RIFs) survive in some of the most extreme terrestrial habitats on earth. Some authors have postulated that they may have given rise to lichens. In fact, some authors have suggested that they might be able to survive on Mars. This is a major topic of research by mycologists, lichenologists, and astrobiologists. Lucia Muggia, Cecile Gueidan, Kerry Knudsen, Gary Perlmutter, and Martin Grube. 2002. The Lichen Connections of Black Fungi. Mycopathologia. DOI 10:1007/s11046-012-9598-8. Lucia Muggia, et al. 2015. Phylogeny of Lichenothelia Species. Mycologia. DOI:10.3852/15-021. 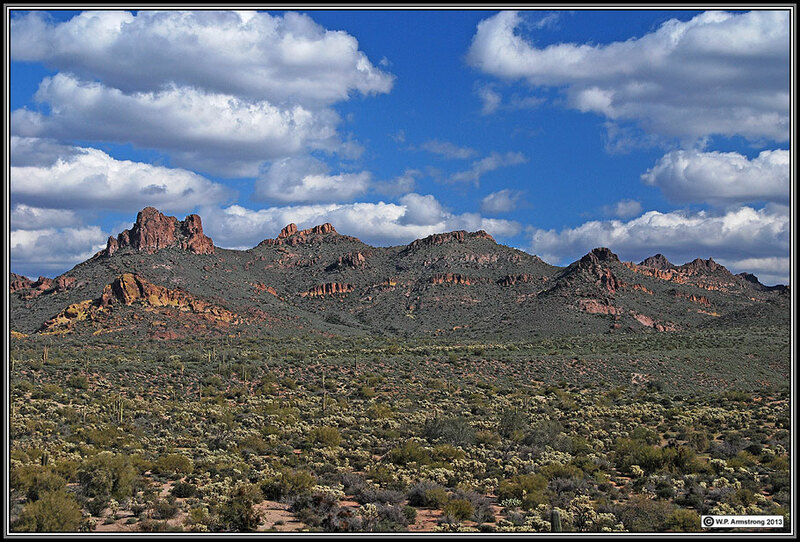 Dacite (rhyolitic) outcrops in the Superstition Mtns are blackened by a coating of black rock-inhabiting fungi (RIFs), and lichens. 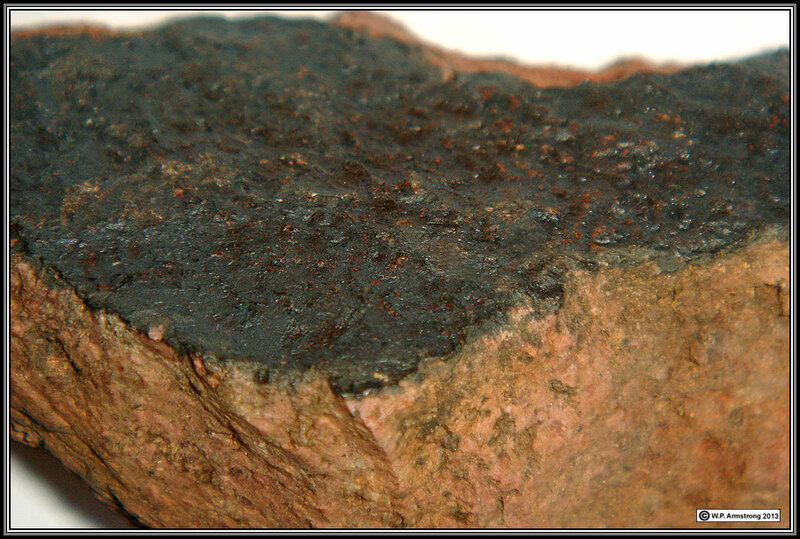 Some rocks also appear to be coated with desert varnish. Black layer on dacite (or welded tuff). There are a few squamules of the crustose lichen Acarospora (white arrow). According to lichenologist Kerry Knudsen (personal communication, 2016), the black layer is a rock-inhabiting fungus (RIF) and not a lichen. I took scrapings from the RIF and placed them on a microscope slide in a drop of water. Under 500x magnification I could clearly see brown, one-septate (2-celled) fungal spores. According to lichenologist Kerry Knudsen (personal communication, 2016), the black layer is the stroma (mat-like, filamentous mycelium) of a rock-inhabiting fungus (RIF) and not a lichen. According to lichenologist Kerry Knudsen (personal communication, 2016) this microscope slide (wet mount) contains a rock-inhabiting fungus (RIF) and brown, one-septate spores. The stroma (mycelium) consists of a mass of fungal filaments composed of spherical cells. The outer layer of the stroma is black with heavily melanized cells to protect them from intense UV radiation. Inner cells are hyaline (translucent). Magnification 500x. 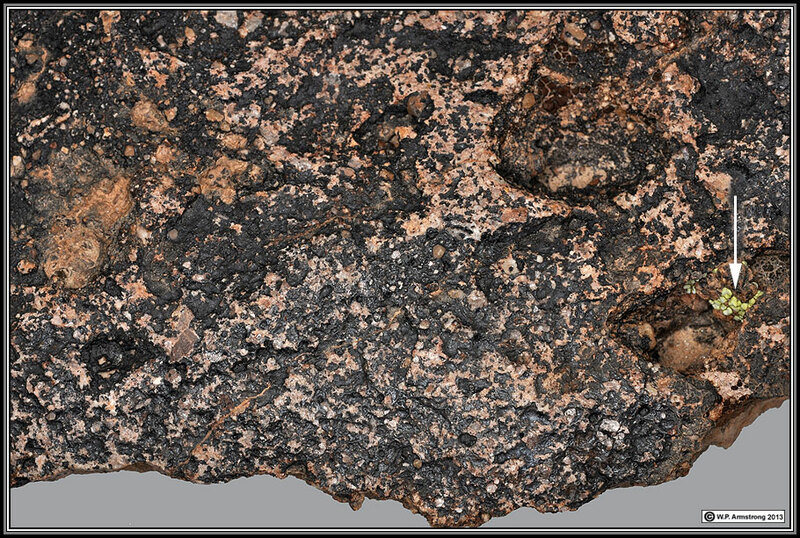 Microscopic view of black scrapings from the rock surface. 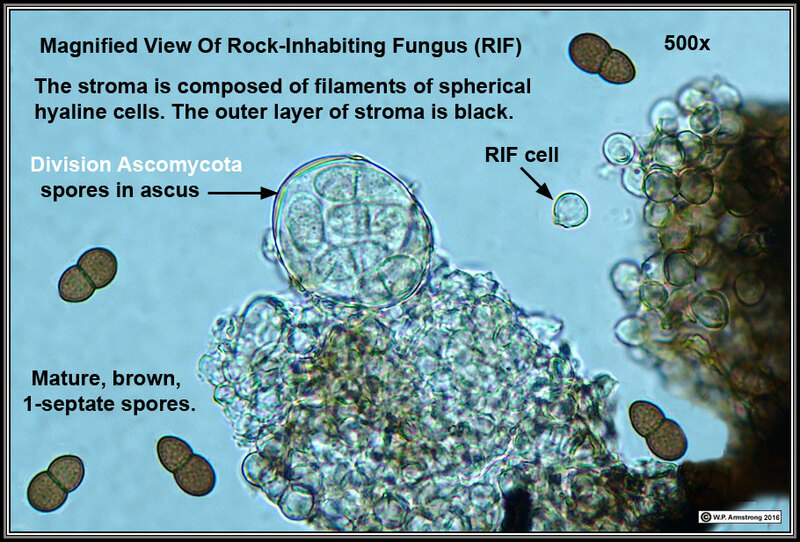 According to lichenologist Kerry Knudsen (personal communication, 2016), the microscope slide contains a rock-inhabiting fungus (RIF): (A) Brown, one-septate spores (ascosores). (B) Spherical, translucent (hyaline) cells from the inner stroma mat. 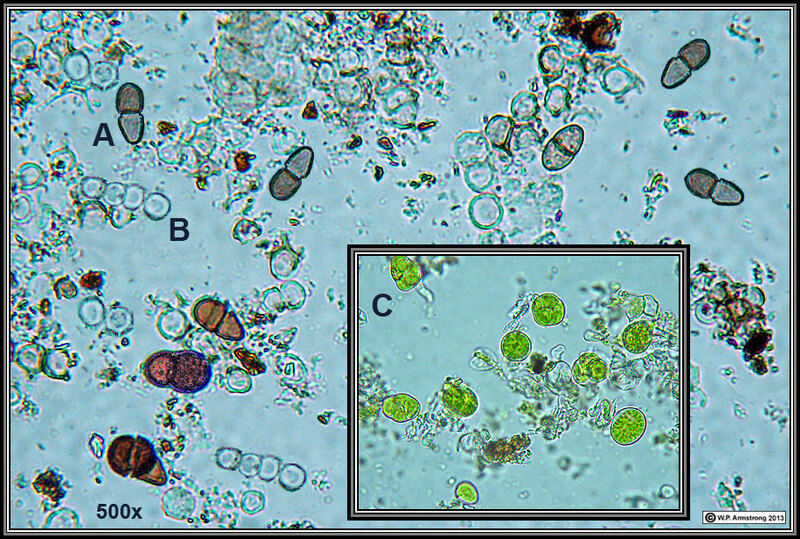 (C) Inset: Cells of a green alga which may be associated with the RIF but are nonlichenized, or possibly they came from a crustose lichen on the rock sample. According to Knudsen (personal communication, 2016), in culture experiemnts the RIF can grow in association with algae but so far have never formed a lichenized relationship with them. The algal cells are approximately 20-30 micrometers in diameter. Magnification 500x.